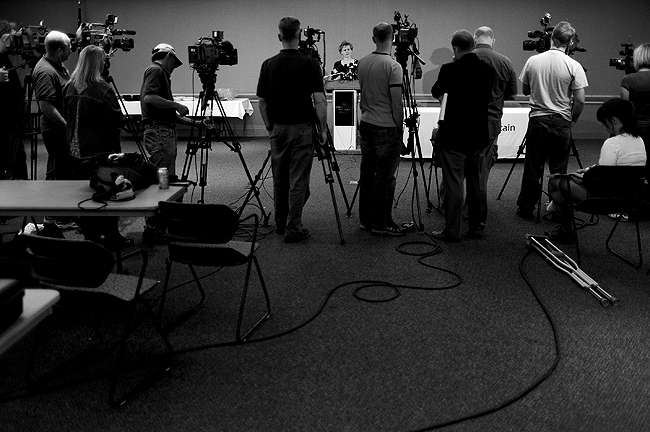 "Janet Frank, spokeswoman for Utah Valley Regional Medical Center, addresses media on the death of Gary Coleman Friday, May 28, 2010, in Provo, Utah. Coleman, the child star of the smash 1970s TV sitcom "Diff'rent Strokes" died Friday after suffering a brain hemorrhage. He was 42." Gary Coleman, 42, the child star of the smash 1970s TV sitcom "Diff'rent Strokes" died last week. I had read the day before of his recent sling of illnesses and that he had been hospitalized as well. As I was shooting another assignment, I got the call to head over to Utah Valley Regional Medical Center for a press conference. Coleman had died. I rushed over with our videographer to cover the presser. Back in Baltimore I felt like there was always some sort of press conference. Utah County doesn't really have much going on, so I guess in that respect that's the reason I haven't really shot many in Utah. Alas, there was a slew of news media there. I had to step back to really take in this non-visual presser to open light to others how packed it was.